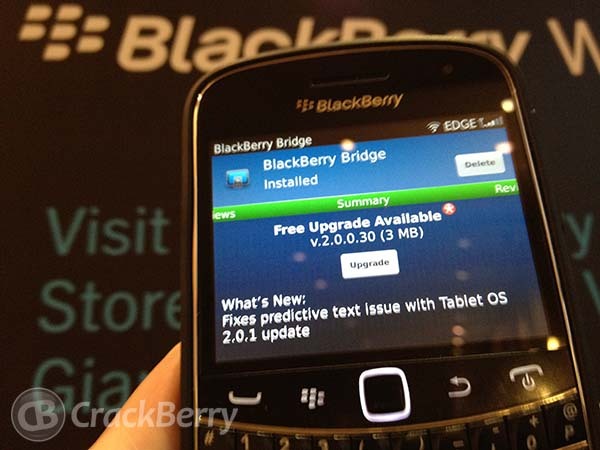 If you're a BlackBerry PlayBook and smartphone owner you'll be happy to hear that BlackBerry Bridge has just received an update to v2.0.0.30. The change log is short on this one listing only a fix for predictive text issues on PlayBook OS 2.0.1, but I know some of you out there have been anxiously waiting for this to be resolved. Now, as we all know, a Bridge update is usually followed close behind by a PlayBook OS update but whether or not that's the case this time around, I guess time will tell. The update should be available for most of you in BlackBerry App World, but if not you can try refreshing with ALT+R,S,T or just sit tight and wait for it to be pushed to your device.